To retrieve your choices please input your email address and the form reference number. 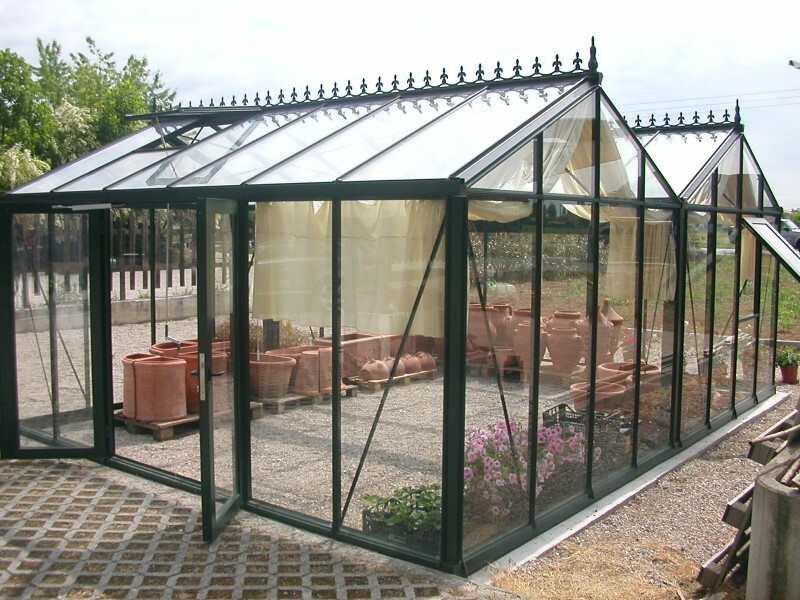 Helios Multibay Greenhouses will suit Garden Centres and small professional growers as well as any number of other uses where something bigger than the normal domestic sized Greenhouse is required. With strong box section aluminium profiles, full length rubber glazing strips, 4mm toughened glass and storm bracing available, Helios Greenhouses are an investment is quality and strength. 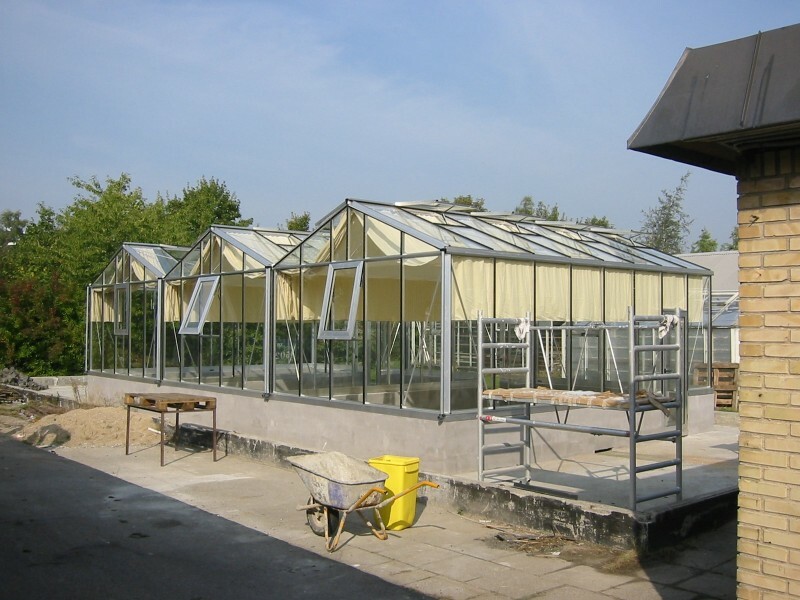 Multibay Greenhouses enable you to work in a larger covered space giving benefits of efficiency and a larger air mass which is more beneficial for growing in. 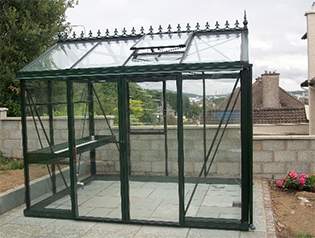 For the strength and quality that Helios Greenhouses provide, compared with other Greenhouses on the market of similar specification they represent outstanding value for money. 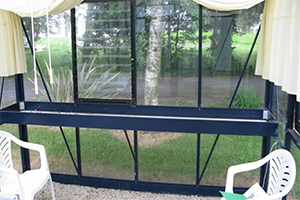 Polyester powder coating protects the aluminium frame from tarnishing with exposure to the elements and is available in a wide range of attractive colours. It is a durable long lasting finish, a bit like enamelling. 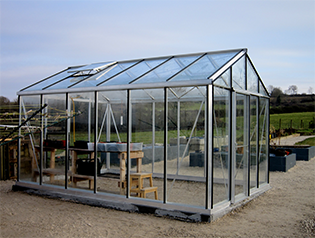 Aluminium which has not been protected against weathering is called ‘mill finish’, this suits people who just want a working Greenhouse without regard to how it looks. 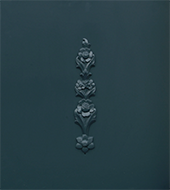 We have a range of standard colours to choose from but you can also nominate a special colour (using the RAL numbering system) if for example you want to match with the finish of your house nearby. Janssens’ louvre vents are a generous size (opening of 69cm x 93cm) giving great ventilation. 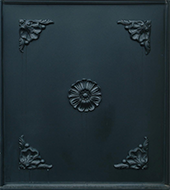 The louvre vent frame is always supplied in black, but being a neutral colour it nearly always blends in. Automatic openers are available for louvres but we suggest you automate roof vents but leave louvre vents manual (unless extreme weather is forecast they can be left open in summer and closed in winter). 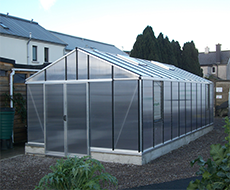 We have allowed for what is considered adequate ventilation by our experience in the basic Greenhouse price but you can never have too much ventilation on a warm summer day. 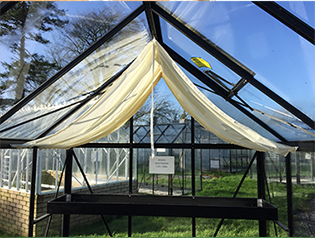 For exposed locations decorative ‘spandrels’ will reinforce the structure greatly, increasing the ability of the Greenhouse to resist buckling in the wind. 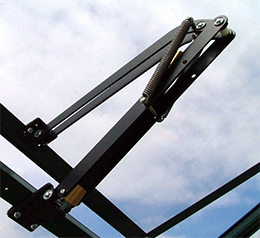 These attractive spandrels will be in the same colour as your frame and are fitted to every second glazing bar. 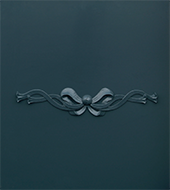 Ornate aluminium ‘retro’ panels, available in three designs, which give a stunning look. 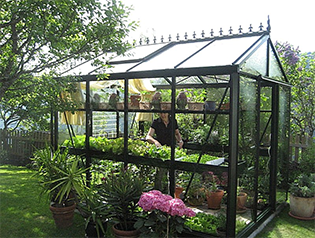 This option will create an unusual feature in your garden and may be the ideal choice where you want to use the structure for an alternative function instead of a Greenhouse, for example as an artist’s studio. A Dwarf Wall Model makes for a very attractive feature in the Garden and has practical advantages too. It means one can build raised beds inside the walls, the temperature in the summer is a little cooler and winter temperatures a little warmer apparently. The wall is normally built and organised by the customer and is not included in the price of the Greenhouse. 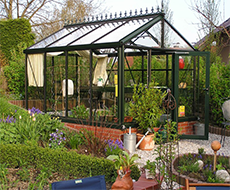 General instructions are available to download on this website but after an order has been placed we will be pleased without additional cost to give a drawing specific to your order for you to give your builder. Sliding doors have been included as standard but here you have a choice to change to hinged. Doors can be fitted to the gable or the side of the Greenhouse. 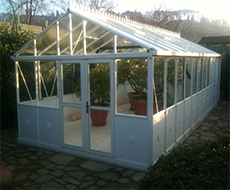 Hinged doors give a Greenhouse a more traditional look than sliding doors. Janssens’ Hinged Doors are fitted with hydraulic door closers to pull them closed automatically and they are fitted with a lock. 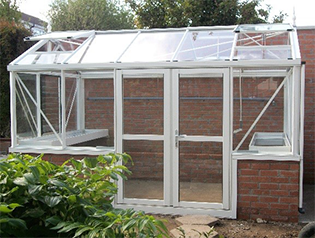 With a Dwarf Wall Greenhouse, if you have a sliding door it slides quite close to the outside face of the wall, and the track that the door slides in is very narrow and must be kept perfectly straight. This means that if you have a builder who will build a nice straight, plum wall with a flat face there is no problem, but if you are for example using stone it will be better to go for a hinged door to avoid problems. with all our hinged doors. 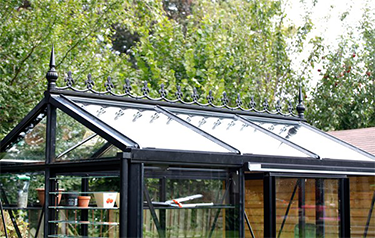 Ornate Ridge crestings and finials provide a bit of extra Victorian style bling to your Greenhouse. It isa question of personal preference and you can select your choice here. The standard door entrance has a threshold bar going across at ground level which is 118mm high (to step over). For most customers this is not an issue but where a lower threshold is desired – for example for wheelchair access we offer a service to modify the door entrance to be only 40mm. 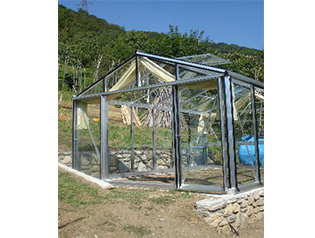 Customer can place after installation of the Greenhouse concrete slabs or raise the floor level inside and outside to be flush with this so there is effectively no lip. The standard door entrance has a threshold bar going across at ground level which is 118mm high (to step over). For most customers this is not an issue but where a lower threshold is desired – for example for wheelchair access you can simply reduce your wall height by up to 100mm so that the door threshold bar will be submerged except for the lip that the door will close against. 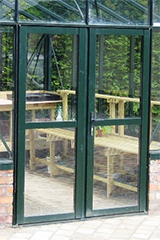 Normally the door has a clearance above the outside ground level of about 110mm (the doors open outwards), when you lower your door threshold by 100mm of course the clearance will only be 8 or 10mm (so will only suit ground that is perfectly flat or sloping down away from the greenhouse). The standard door entrance has a threshold bar going across at ground level which is 118mm high (to step over). 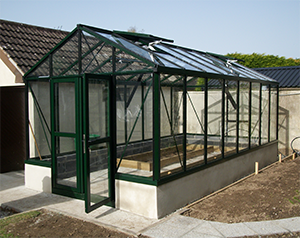 For most customers this is not an issue but where a lower threshold is desired – for example for wheelchair access we can modify the Greenhouse to have longer doors and door posts so you can submerge the door threshold bar to reduce the lip by up to 100mm. Simple devices which open and close roof vents automatically for you according to temperature. They contain an industrial wax‐like substance inside a cylinder which expands and contracts with according to the temperature and pushes or pulls a rod that opens or closes the automatically. The temperature at which they open and close can be adjusted by hand but you cannot manually open the vent. The cylinder containing the wax‐like substance is a consumable item but typically lasts a number of years and can be easily replaced. Generally in windy weather automatic openers are cooled down by the wind and so close the vents. This robust opener has a strong closing force. 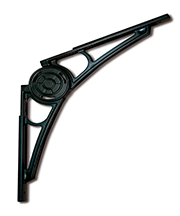 It has a maximum opening of 35cm (14″) and comes powder coated in a black finish. Its opening range is between 15C and 25C. 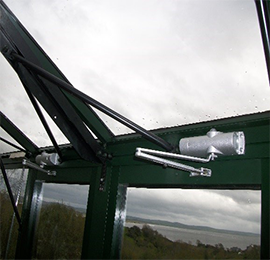 The Hydraulic Check Autovent has a small hydraulic damper which only allows the vent to be opened slowly but it can shut quickly, thus protecting the roof vent. 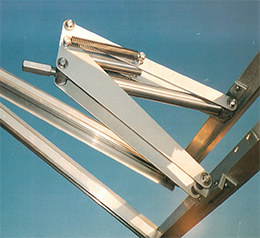 The hydraulic check Autovent is advisable in areas where severe conditions are encountered. It can be set to start opening at temperatures between 16C and 23C. Supplied with a satin anodised finish. Don’t be fooled by the name, a seedbed can fulfil many purposes. 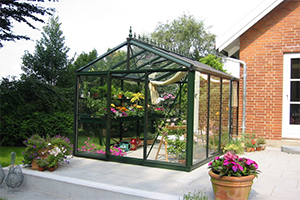 First and foremost it provides a comfortable surface on which to pot up and tend to plants. 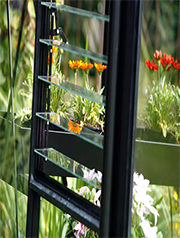 You can use it to display plants on and it gains you additional space in the Greenhouse. 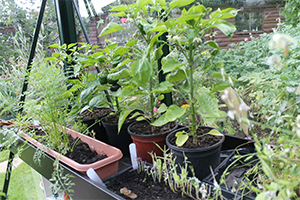 A seedbed can be fitted with capillary matting to assist even water distribution among your pot plants or you can fit an electric thermostatically controlled heated mat in it to make a propagator. The Janssens shelf is an aluminium section 115mm wide. It is useful for small pot plants and odds and ends like gloves, secateurs and other small odds and ends. 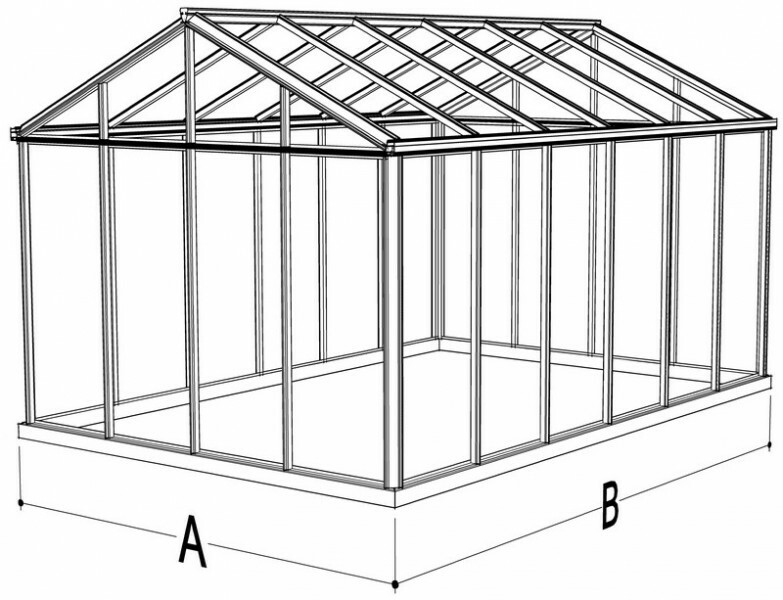 A shelf also adds to the already powerful strength of the Greenhouse. 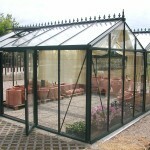 It is supplied in the same colour as your Greenhouse. 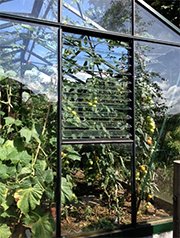 Janssens’ attractive shade screen comes in 3m lengths and is fitted like a curtain, it will slide allowing you to pull it over exactly the area you want to give shade to and push it away when you want more light. Equally useful for shade loving plants that do not want direct sunlight or customers who want to enjoy sitting and reading a paper in the shade! The price is for one screen 3m long in one bay. This model must be built by us, it is not suitable for DIY building. We need to know the location of the site before pricing construction. 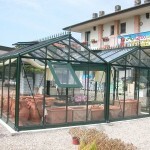 To obtain a quotation for this Greenhouse that you are pricing please click on the button below. 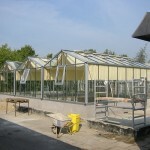 Our construction service price is based on any foundations, ground works and walls being prepared by the customer in advance of our arrival on site.Details on foundations are available on the instructions tab on this website page, and we will be pleased to discuss any queries you have and if necessary provide further drawings specific to your Greenhouse once an order has been placed. How do get that price? Tim voluptatum deleniti atque corrupti quos dolores et quas molestias excepturi sint occaecati cupiditate non provident, similique sunt in culpa qui officia. 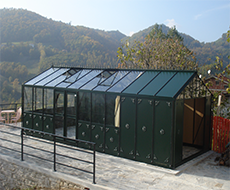 We bring the Greenhouse with us to construct it. 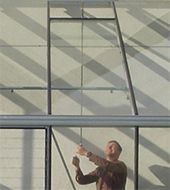 The lead time is the estimated length of time from when your order is placed to when we arrive to start building. This is a guideline only as lead times may vary according to demand and logistical considerations. Normal lead time is eight weeks. 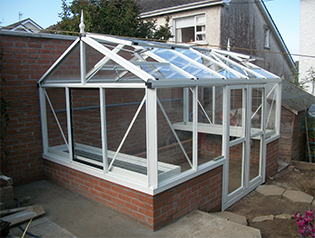 If a low door threshold or our construction service is ordered add two weeks. 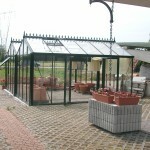 For a Dwarf Wall Model or a Narrow Glass model add one week. 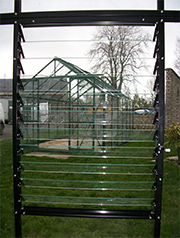 For powder coated models other than Green (RAL 6009) or Black (RAL 9005) or with decorative aluminium panels add two weeks. 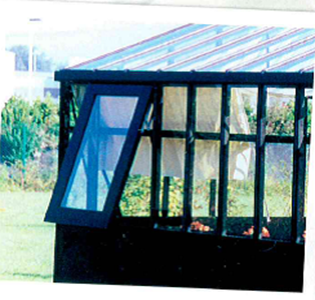 Extra Hinged or sliding doors may be added and fitted to the gable ends or sides of your Greenhouse. 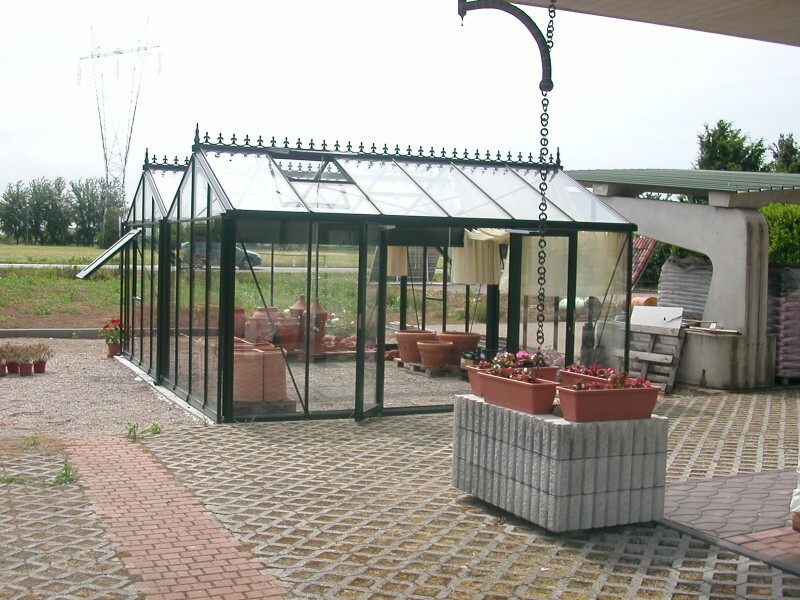 We can modify your Greenhouse to have a side or end up against a wall. 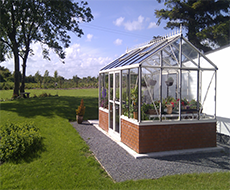 A great solution where you have a wall which is not high enough for a straight lean‐to Greenhouse but wish to avail of the benefits having a south facing wall affords. 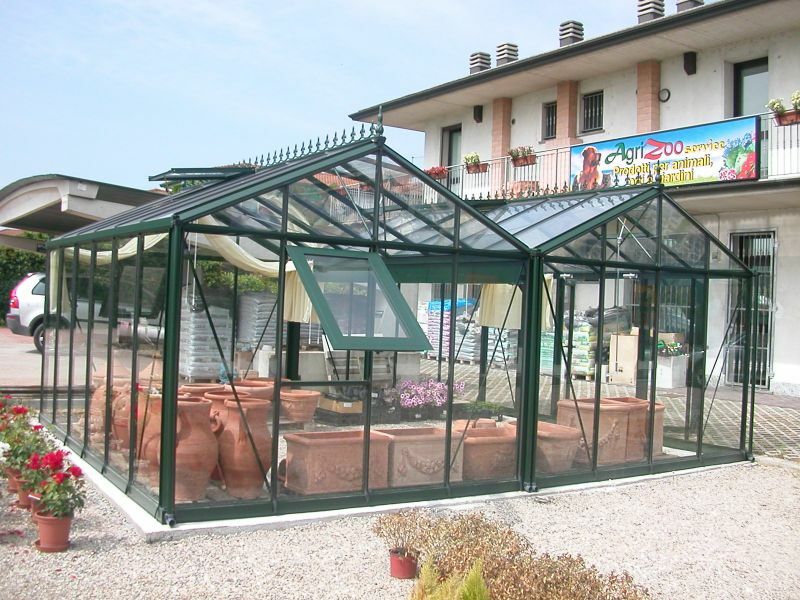 K Glass is horticultural glass with a coating which greatly lowers its K value (heat loss value). 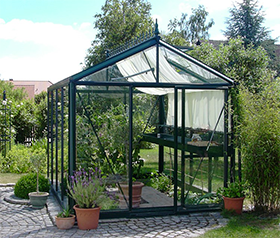 With K glass you can have the benefits of insulation without the downside of not being able to see through it clearly. 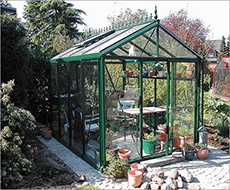 K Glass is the same price as 10mm twin wall polycarbonate but is not toughened so not as strong or as safe as toughened glass (which shatters into tiny pieces rather than big shards) when it breaks. We will be pleased to quote for it on request.